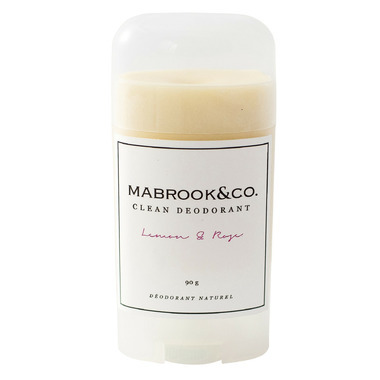 This Mabrooke & Co. Clean Deodorants is 100% natural and aluminum-free. It combats odour by combining pure, natural, and organic ingredients in the most powerful and safe formula possible. This deodorant contains NO parabens, phthalates, propylene glycol, petrochemicals, aluminum, or toxins. Directions: Apply a small amount of product (1-2 swipes) to clean underarms. Allow product to absorb for maximal efficacy. I highly recommend this brand. Soft to the skin and the smell last long (even 2 days). I LOVE Mabrook & Co. deodorant because it's completely natural and actually works! My only issue are the scents. I don't love any of the blends, and sadly, the lemon and rose has to be my least favourite scent so far.